No doubt, Facebook is the biggest social networking site of the planet till date. It have billions of users worldwide; it’s obviously more than a country population and the main thing the users are increasing day by day in the countries like India. Now, we all aware the Facebook features like Chat, Fan Pages, Like, comment, share blah blah but it have some amazing features too that are lesser known among the users. Today, we are going to reveal all those lesser known amazing features of Facebook. Update the title and description of the link, before sharing. If you wants to share a link on your Facebook timeline, Group, Facebook Fan Pages etc. but don’t like its title and description that is fetched by Facebook? No worry, now you can edit its title and description. To do that, just hover the mouse above the title or description you wants to edit and click on it. There will be a text box, just enter your title or description. Click More to check Friendship between other friend. Facebook friendship page shows the collection of stories and connection between you and your friend. Like the photos in which you both are tagged, tagged status, events joined together, mutual friends, the places you both had visit and the things you both liked on Facebook. To check the friendship between you and your friend, click on your friend’s timeline and select ‘See Friendship‘ , it’s just after the Message button on your friend timeline/profile. More information about Facebook Friendship page can be found here. Bonus Tip: To see who joined Facebook due to you just go to See all invites and imported contacts and sort the users by Joined. Here you’ll see all the contacts you imported or synced to Facebook. We recommend you remove all the imported contacts to be safe. Now,Facebook also have the backup option available through users can download their all Facebook information.The backup includes your photos, videos, Wall posts, messages, chat conversations, friends’ names and their email addresses. To back up your information just go to Account Settings (Direct link) and hit Download your copy of your Facebook data, located at the bottom of General settings. Click on the photo to create your own Customized Badge! Facebook also lets you create many type of badges for embedding on webpages and easy sharing your Facebook profile. At present, Facebook provides four types of badges for it user. Profile badge, Page Badge, Photo Badge and Like badge. Few days back Facebook launched Quick Group Chat feature in which users don’t have to create group and then adding member/friends to it to chat.Now,user can anytime create a quick group and can add friends to chat specially needed when something to be discuss among friends in emergency.To do the same just click the gear button while chatting to one of your friend and hit Add Friends To Chat [Top Option],enter the names of friends to chat and hit Done! Many folks know this but some freaks don’t know this awesome feature of Facebook,so this is for them.Yeah,Facebook also have the feature of Video Calling to Facebook friends.You just have to go to Facebook Video and install the small plugin to enable the feature.After installed just click over call in the chat window to enjoy video calling. Now,you can send emails right from your Facebook messages instead of going to email services and login there right from your Facebook messages,even you can also attach files and photos to emails to be sent.To send emails from your Facebook account just type the email address you wants to send in To section of your Facebook message. Just enter the email id in the ‘to’ field of Facebook messages to send an email. The location tab in your sharing tools enable you to share your current location with your status,photos to show your friends you were at this place at this time.Now,how is this feature is very beneficial suppose you tag a place that you are at present here,your nearby friends can also join you by seeing this location,your friends come to know your favorite places,they even can give you some tips etc.You can even tag any place,restaurant,bar etc.To share it just hit location icon in your sharing tools and enter the place-name. Bonus Tip: Even you can also share that you are with these friends at this place in your photos,status .To do the same just hit location icon in your sharing tool and enter friends name to tag them in that particular post. Do you wants to change the schedule of your status,photos,videos to past date?Yeah,you can do that just hit clock icon and change date to past dates in sharing tools while sharing any story.You can also change date of a particular previous stories shared on your timeline,just hit the pencil button on the right of stories and hit change date to show it in past dates in your timeline. 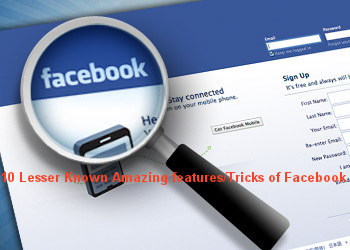 Hope you like my read and learn something new by this post on 10 lesser known amazing features/Tricks of Facebook.Don’t forget to share this among your Facebook friends.Subscribe to our Email Newsletter below to get more awesome articles/tricks related to only Facebook. Do you have any other Facebook trick? Share with us in comment section.